WARNING: RAPID CHANGE IN PROGRESS! FIRE-EARTH Models show the rate of global change has intensified by a factor of at least 26 in the last decade compared with the 1960s. FIRE-EARTH defines ‘global change’ as the deterioration in the planet’s life-support capacity that is caused by large-scale anthropogenic impact, leading to a total collapse. When Will the Collapse Occur? In The First Wave of World’s Collapsing Cities posted September 4, 2007, the Moderators forecast the first phase of collapse could occur as early as 2012. The Moderators confirm that the timeline and speed of collapse are consistent with their earlier forecast. Philippines farmlands are drying up in the intense heat; there’s no rain in sight. The El Niño has affected about 160,000 hectares (ha) of farmland in the country, destroying more than 200,000 MT of crops including palay, rice and corn. “Below normal rainfall is threatening some 42,000 hectares of rice paddies in the region, with 11,000 already beyond recovery and another 21,250 damaged. The dry spell has also affected corn crops in other areas.” FEWW said. To ensure food security, for now at any rate, the Philippines National Economic and Development Authority (Neda) is buying 2.65 million MT of rice, mostly from Vietnam and Thailand. Persistent Drought in eastern and northeastern Syria regions has driven about 300,000 families to urban areas in search of work, a worrying massive population displacements in Middle East in recent history. Some villages have lost about half of their population to overcrowding cities. More than 80 percent of livestock on small and medium-sized farms have died as a result of a 75-percent rise in the cost of animal feed. 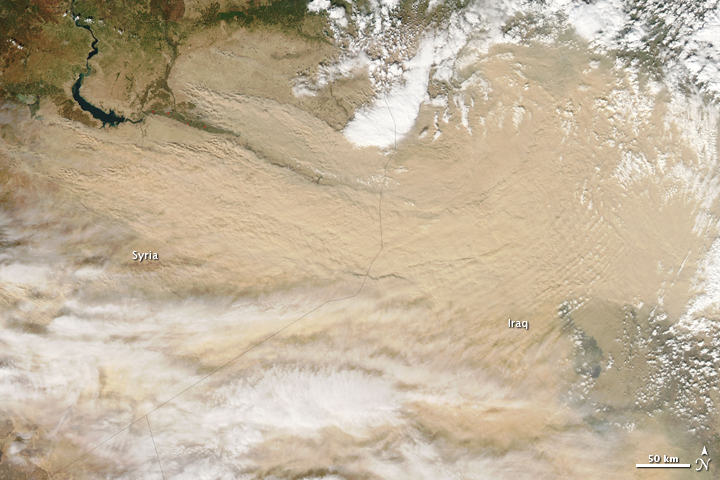 A dense plume of dust [sand] swept from Syria into Iraq on February 22, 2010. This photo-like image of the dust storm [sand storm] was captured by the Moderate Resolution Imaging Spectroradiometer (MODIS) on NASA’s Aqua satellite in the early afternoon (12:30 p.m. in Syria, 1:30 in Iraq). Distinct plumes rise from many point sources in the Syrian desert. Within a few kilometers, the plumes blend into a dense cloud that completely obscures eastern Syria and western Iraq. The veil of dust is thick enough that the ground beneath is not visible, which means that people on the ground are probably getting little light from the Sun. Image Credit: NASA/MODIS/Jeff Schmaltz: Caption: Holli Riebeek. In China’s southwestern provinces of Yunnan and Guizhou, up to 4 million hectares of crops have been damaged by severe drought. Water shortages are affecting about 6 million people and 3.6 million livestock. Several of China’s northern provinces are also affected by the dry spell, with major signs of stress emerging in the farmlands after a 40-day drought. At least 42 people were killed and 120 others injured when torrential rains ledt to massive mudslides on the Atlantic resort island of Madeira flooding the popular holiday destination and destroying about 240 homes and damaging many more. Roads and other public infrastructure were also damaged by the storm. Heavy rains which triggered extensive flooding in the country’s southwest province cut off access to the city of Jerez, prompting the authorities to shut down the airport. In Tenerife, Canary Islands (Spanish Territories), strong winds and violent downpour led to deluge across the island and left at leat ten thousand homes without electricity, according to the officials. The sum total of human activities on the planet is exponentially INCREASING. Humans consumptions of energy and resources continue to increase in parallel to its activities. Pollution including greenhouse gas emissions resulting from increased energy consumption is accumulating. The increase in the consumption of energy and resources is enlarging humans ecological footprint. The impacts of humans’ ever-enlarging ecological footprint and the accumulating pollution have driven most of the planetary-scale ecosystems to the verge of collapse. In the absence of any intervention by the forces of nature, the large-scale ecosystem such as the atmosphere, climate, oceans, soil … will completely collapse, rendering the planet unable to support large species. We can say with the maximum degree of certainty that in the absence of any ‘remedial action’ by natural forces the state of our planet would progressively worsen [NOT improve] with time. However, there is a high price to pay for the nature’s balancing act functions. The effect of Nature’s balancing act functions, as harsh as they may be, should be viewed as desperate last measures: Survival of some, or extinction of all. EDRO Moderators believe that the impact of global climate change, including extreme rain events, storm tides, and rising sea levels caused by both melting ice and slowing down [or disappearance ] of Gulf Stream could flood large swaths of eastern United States, especially the coastal areas of Florida. Cities and population centers both on the Atlantic and Gulf coasts could experience complete or partial inundation for some of the year, most of the year, or permanently. About 40 percent of Florida’s more densely inhabited areas, home to more than 65 percent of the population, could be impacted by the climatic events, rendering most of the existing cities effectively uninhabitable and affecting up to 90 percent of Florida’s population. Some of the areas most prone to flooding are marked on the map. The markings are meant as an indication only. They do not represent exact locations. Source of images: Unisys Weather. Images may be subject to copyright. The moderators are debating the type of data, degree of detail as well as extent and depth of information that should be posted on this site. The following table lists the world’s cities that are likely to collapse completely or partially by or before 2012¹ in the first wave of collapse. The collapse would be caused by a combination of environmental catastrophes; failing infrastructure; food, water and fuel shortages; infectious disease; civil conflict. Following the first phase of collapse, massive waves of human migration from the affected areas create domino effect that cause the collapse of the remaining population centers shortly after.